Hoping to give mother nature a helping hand, researchers have bred the corals to make them better able to cope with our changing climate – rising sea temperatures and increased acidity. They are now growing in experimental field conditions on the Great Barrier Reef, to see if they can also thrive in the wild. Professor Madeleine van Oppen, an Australian Research Council Laureate Fellow at the University of Melbourne and the Australian Institute of Marine Science (AIMS), is leading the project. "Most corals in the wild are living at the very top of their survival limit in terms of temperature," Professor van Oppen says. "The Great Barrier Reef lost half its coral cover during the back-to-back heat-induced mass bleaching events of 2016 and 2017." She notes that the Great Barrier Reef has warmed by around 0.6 °C since the 1950s, contributing to more extreme and frequent marine heatwaves. "Without a curb on greenhouse gas emissions, tropical sea temperatures are predicted to rise by 2-3°C by the end of the century compared to pre-industrial times. So it is vital we help corals adapt," Professor van Oppen says. During summer heatwaves, corals become stressed and lose the microalgae that normally reside inside them in a mutually beneficial, or symbiotic, relationship. Corals receive most of their nutrition from the algae, so without them they starve and often die, turning white – coral bleaching. Climate change also means that oceans absorb more carbon dioxide from the atmosphere, which makes seawater more acidic. When combined with rising temperatures, increased acidity can make coral more sensitive to bleaching – making it more difficult for them to form their calcium skeletons. In an effort to develop coral that can withstand these harsher conditions better, Professor van Oppen's team is breeding corals using in vitro fertilisation or IVF. "We are speeding up evolution to help them adapt," says Professor van Oppen. The techniques the team are using have been traditionally employed to improve crops, livestock and aquaculture species, as well as in wood production, and are based on accelerating naturally occurring evolutionary processes, she says. Scientists call this 'assisted evolution'. Assisted evolution doesn't create genetically modified organisms (GMOs), instead it accentuates and optimises characteristics already present in some corals. One assisted evolution method is hybridisation, where individuals from two genetically different lineages (or ancestry) mate successfully to form a hybrid. This can be between different species or between distantly related populations of the same species. 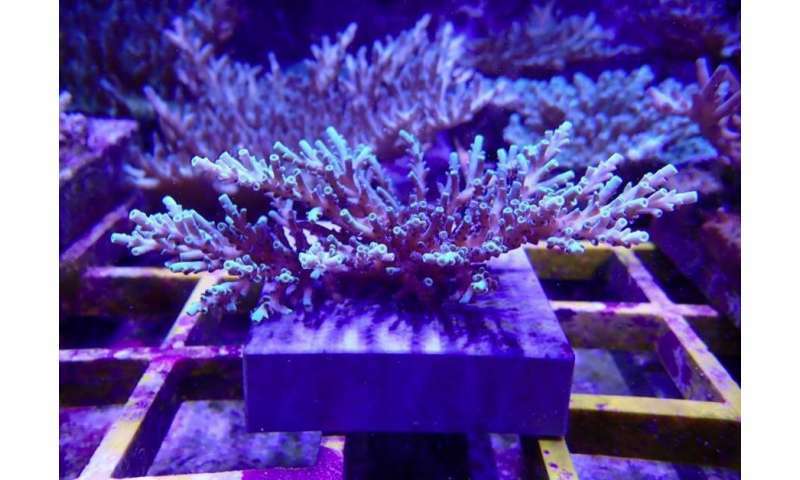 "We chose to focus on Acropora corals because they are among the most important corals responsible for building the immense substructure that supports the Great Barrier Reef." The team collected corals from the reef and brought them back to the National Sea Simulator at AIMS. As the corals spawned by moonlight, which is the trigger for their annual spawning, sperm and eggs were collected by a team including Ph.D. candidate Wing Chan and Ms Lesa Peplow from AIMS. Working with a system of colour-coded bowls to keep track of the sperm and eggs from each species, they then used IVF to create hybrid embryos, as well as enabling the sperm and egg from individual species to fertilise itself, creating purebreds. The baby corals were then grown in the ocean simulator for seven months to study how they coped under predicted future ocean conditions of increased temperature and acidity. The team examined if the corals survived at all, if they took up food-producing algae from their environment, and measured their size to determine growth and good health. "We were excited to find that some of these coral hybrids grew and survived better under elevated temperatures and acidity levels, compared to their parents," says Professor van Oppen. "Because the corals are resilient in the lab, we now want to see how they will grow on the reef, in the natural environment where their parents were collected." Using the first experiment as a guide to the best species, the team created seven types of IVF coral embryos (three hybrid and four purebred types). Some of these were placed at a Great Barrier Reef field site by University of Melbourne Ph.D. candidate Annika Lamb and colleagues from AIMS. The corals are settled onto terracotta tiles that represent the sea bed, and labelled with their species details. "This controlled field testing is an important next step when assessing the benefits and risks of intervention methods aimed at increasing resilience to climate change, and for future coral reef restoration," Professor van Oppen says. "We will see how the IVF corals do this summer, and whether the hybrids perform better compared to the purebreds in the field."